LisaMMM628@aol.com 859.227.4101, Contact Lisa for private coaching in meditation. Meditation is a tool for rediscovering the body's own inner intelligence. Practiced for thousands of years, it's not about forcing the mind to be quiet; it's about finding the silence that's already there and making it a part of your life. Silence is the birthplace of happiness, creativity, and infinate possibilites. From this field of pure potentiality we ge our bursts of inspiration, our most intuitive thoughts, and our deepest sense of connection to the Universe. Practicing meditation on a daily basis allows us to weave silence and stillness into our mind and body to create a life of greater compassion and fulfillment. Meditation is a journey to the center of our very being, to emotional freedom, and to the reawakening of our unconditioned self. 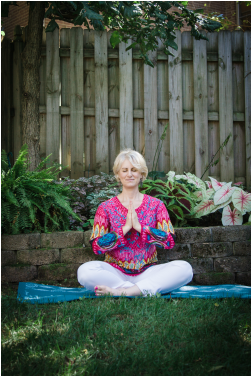 Originating from the ancient wisdom of India, Primordial Sound Meditation is one useful technique that Lisa teaches to assist students in integrating a meditation practice into a daily routine. Primordial sounds - the basic, most essential sounds of nature - are used to disconnect us from the activity of life. These individually selected sounds, known as mantras, are based on the vibration created by the intake and exhalation of breath, and the vibration the universe was making at the moment of your birth. Once your Primordial Sound mantra has been determined, you will be taught how to use it on a daily basis to reawaken balance, tranquility, and compassion within. Nowadays, doctors are increasignly citing stress as a major contributing factor to most illnesses. Even though meditation should not be considered a cure by itself, research has shown it to be beneficial for a wide range of health problems. As stress is greatly eliminated though meditation, our minds and bodies begin to function with maximum effectivelness, creating health, vitality and happiness. Session One will be an introduction to the basic principles of meditation, it's history, and the importance of your mantra. In Session two, you will receive your personal mantra and learn how to use it. You will try meditation for the first time using your Primordial Sound. In Session Three, you will learn the practical aspects of meditation, will share your experiences, receive answers to any questions, and will meditate with the group and with Lisa. Session four will feature a lecture about the higher states of consciousness that can be achieved with regular practice, and Lisa will share Deepak Chopra's vision of these higher states based on Vedantic wisdom teachings. A meditation practice is recommended for anyone who wishes to enjoy deeper peace, greater freedom from habitual stressors, and greater life perspective. The workshop is an abridged version of the course and is typcially a half day event. This shorter class introduces some of the main elements of the full course and familiarizes students with the basics and comforts of a sitting practice. By the end of the session the group meditates together and a Q & A session completes the workshop. *Meditation practice WILL BE taught at all scheduled Women's Circle Retreats. Please click the Schedule of Workshops & Retreats heading above for details.